A recent study on floor safety suggests that many businesses' fall prevention programs may overlook the effects of flooring selection and ongoing maintenance on slip resistance. The study was produced by CNA, a provider of insurance and risk management services. The resulting report said that floors in 50 percent of the surveyed sites failed to produce a dynamic coefficient of friction (DCOF) level above the minimum threshold of 0.42 (American National Standards Institute). The review of slip and fall liability claims occurring from Jan. 1, 2010 to Dec. 31, 2016, found high-frequency but low-severity trends, which is consistent with claim experiences in the greater risk control industry. 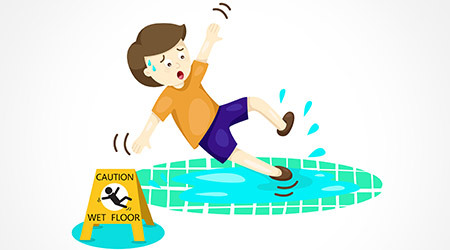 There are many factors that contribute to slips and falls. It's important for people tasked with maintaining floors to identify hazards and do whatever possible to improve safety.